Discovered this book at the Library and took it home. There was this picture of the 2 cinemas which were a main part of my childhood year. The cinema on the left is the Venus cinema and the one on the right is Golden City. I remembered when I was a very young kid, my neighbour brought me to Venus cinema one evening because the famous actress, Chan Poh Chu was making a stage appearance. There was a big crowd gathered there that night to see her and watch her movie, Lady Killer. Both cinemas screen mainly Chinese movies and whenever we can afford, which was like once in a blue moon, we will go and watch the Shaw Kungfu movies. Both cinemas have now been converted to churches. A pity but at least they are still standing. Surprisingly, I don't have much recollection of the fountain in the foreground and I don't even recall it sprouting water! 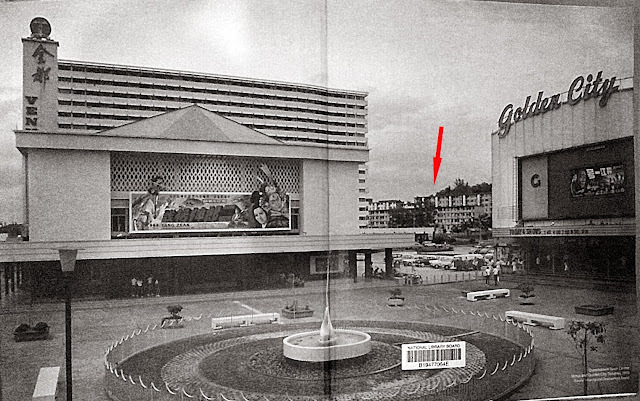 In the background, where I have put in a red arrow, was where I used to stay when I was a kid. Unfortunately, I can't find any pictures of our old block in the book. That area was then known as Margaret Close and there is practically no article or write up about this area in the many Queenstown blogs and sites. What a pity! Guess those were demolished much earlier before the people decided to document Queenstown history.